Virtually every game that has been released over the last decade comes with a multiplayer option. Many games are designed solely for online play, with single player modes carelessly tacked on by programmers during the end of development. Yet, the odds of a new game breaking into the mainstream gaming community for any length of time, or being adopted by the pro leagues, are extremely low. In fact, many of the most popular games played online, especially with pro tournament players, are nearly a decade old (and some even older), and while they’ve often been patched, modded and improved by the community, we’re still talking about source code from a period when computers had single processors and less powerful graphics capabilities. Sure, when the latest Halo or Call of Duty reiteration hits the shelves, there is a flurry of activity of online play, but few games last the length of time that classics such as Starcraft and Counterstrike have done, but why? Surely, as technology advances, video games just get better and better; and yet, after a decade after their release, old games such as Starcraft and Counterstrike still boast huge online communities. Many modern games don’t seem to have the staying power of older games, despite the improved graphics and enhanced gameplay. To figure out why this is, it’s best to look back at some of the most popular online games to understand what made them so popular in the first place. World of Warcraft - was the game that pretty much defined the MMORPG genre. Still going strong with over 12 million subscribers who don’t mind paying monthly subscription fees, romp into the world of fantasy was revolutionary in so many ways, but mainly by introducing cooperation rather than player versus player, which made gaming into a truly social experience. 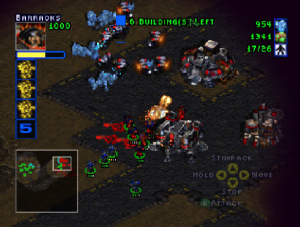 Starcraft - The original came out in 1998, and people still play it. This game was one of the first video games that people played professionally, and while not the first type of game in its genre, Starcraft’s use of three distinct races, changed real time strategy forever, helping players feel almost part of the race they were battling for and giving them a sense of belonging to a tribe. Counter Strike - Perhaps the most popular online game in history. What started as a mod for Half-Life, soon took on a life of its own. Again, the introduction of cooperation between players, where online gamers needed to employ strategy and tactical advantage rather than just run around and shoot, revolutionised the first person shooter forever. Diablo 2 - much of the success behind Blizzard’s classic online games is owed to its simplicity. A simple hack and slash game with spectacular graphics, the learning curve was quick, enabling gamers to become fully immersed and competent without having to spend months practicing. Battlefield 1942 - again cooperation is a key element in this WWII online shooter. That and the fact players could not only run around and shoot each other, but also fly choppers, planes, drives jeeps and blow the hell out of each other in tanks, all of which made it a truly immersive experience. Civilization 4 - while turn based strategy games have never stolen the online community’s imagination, probably due to gamers having to sit and wait for their go, Civ 4’s rich gameplay and intelligent user interface made it a fun and engrossing multiplayer experience, which soon became one of the most popular strategy games ever..
With most of the above games, one strong element above all others has made them so popular - teamwork. Cooperation between players, involving communication and strategy, turns online gaming in a social experience, making gamers feel part of a team. This aspect of gaming is all too often overlooked by current developers who put emphasise on slick graphics and gameplay, rather than the need for gamers to work together as a team. Surprisingly, one genre that never seems to build large online followings, despite the promises and hopes of the developers, is racing games. Considering the cost of running a car for young people with the price of gas, servicing and insurance (even if you get no deposit car insurance the running costs are usually higher than what most people spend on their cars), you’d have thought virtual driving would be an easy sell. However, other than Motorsport Simulations’ iRacing, which has a small but steady following, games like Codemasters F1 2011 have failed to generate online communities achieved by other gaming genres. The reason for this is simple. Online racing not only fails to allow for cooperation, but also the gaming experience is flawed. While losing a life in a FPS and having to respawn is annoying, crashing out during a race simulation pretty much means the end of the game. Even with damage mode off, trying to catch up with other racers becomes impossible, and invariably, these games often start with half the field crashing into each other on the first corner, leaving only a handful of players left in the race, which leads to an unfulfilling gaming experience. Good article. Very true about the last part, rarely ever see competitive racing tourneys. DOTA is also still up there despite there being HoN and LoL around, we will see if DOTA2 can pull all the fans for very long. These games also employ co-op and strategy so they were also heavily adopted. Trackmania has quite an online following. Especially because it fixed the "unfulfilling experience" flaw. With things like best track time, and stunts being the objective of the race. I remember we pushed trackmania some years ago. It was free and a featured game at ESWC. Maybe worth another try in Q1 2012? I would really like to play games like Guildwars 2 when it comes out with True Trinis.....but everybody running down the same old FPS experience. But i digress......great article....and everygame should have co-op....and gamers need more stable connections!! I second this, tired of FPS online and EVERY GAME should have some sort of co-op. Gamers are getting more stable connections and the excuses now are running low.